Ambi–Aqua is a superior glass roof product in the Ambience range with exceptional heat reflection capabilities. 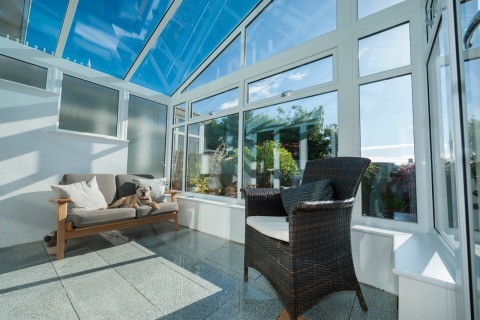 Reflecting 78% of the sun’s heat, Ambi-Aqua can reduce the internal temperature of a conservatory by up to 9°C during the hottest summer months. Ambi-Aqua also provides greater glare reduction, thanks to its visually stunning aqua tint. 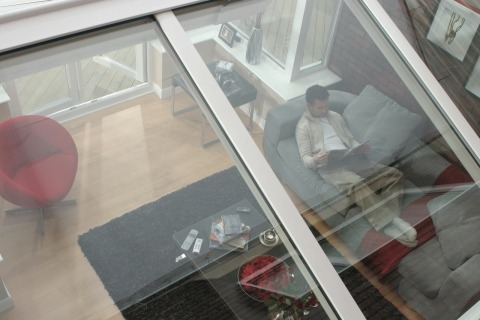 This high performance glass is the most modern and reliable glass roof option offering year round surroundings to live in. The Ambi-Blue glass roof option comes in a delicate blue tint and offers up to 60% reflection from the sun’s heat rays; reducing the internal temperature of a conservatory in summer for easy all year round living. There are many advantages to installing this beautifully coloured roof glass, including a 53% reduction from the sun’s glare which protects furniture and fabrics from fading. As with the majority of glass within the Ambience range, Ambi-Blue is self-cleaning, making this a striking option for any conservatory installation. The Ambi–Neutral glass roof option has the least amount of tint in the range, providing a natural look to any finished room. Offering homeowners benefits such as reducing the sun’s glare by 63% and self-cleaning, the advanced technology of this glass also reflects 60% of the sun’s heat whilst optimising thermal insulation during cold winter months. One of the key elements in roof size is the limitation of glass unit size. The size of a glass roof unit is limited by current technology where it requires an extra frame, a muntin bar, to be inserted horizontally as a greater area needs to be glazed. Unfortunately muntin bars themselves are considered unsightly by some consumers. With the introduction of Ambi – Max, a 4mm toughened super length glass, we are now able to supply glass units to a maximum projection of 4000mm. This option is available on the majority of the Ambiance range, allowing for much larger high performance roofs to be built without the inherent problems associated with traditional muntin bars. Our self-cleaning glass or easy clean glass has a coating that reacts with UV rays in sunlight to generate a photo catalytic process that loosens and breaks down organic dirt particles on the surface of the glass. The surface of the coating is hydrophilic, therefore instead of forming droplets, it attracts water so that it spreads and forms a thin film that sheets away quickly. It then dries off without leaving unsightly drying spots and certainly deserves the “easy cleaning glass” tag. As its name suggests, solar control glass helps regulate the amount of solar energy that enters a building. Solar control glass saves money by reducing the amount of energy used by heating and air conditioning systems in cooling your conservatory and boosts comfort levels inside the building by controlling indoor temperatures and light levels. This makes the biggest impact in helping you use your conservatory all year round. All internal heat is retained reducing your energy costs in the winter and making your conservatory a living room all year round. We will measure glass light transmission to create a comfortable environment so that too much light, glare or reduced visibility will not become a problem. Our glass units are Argon Glass filled, providing excellent thermal efficiency for your conservatory roof allied to practical and low maintenance.